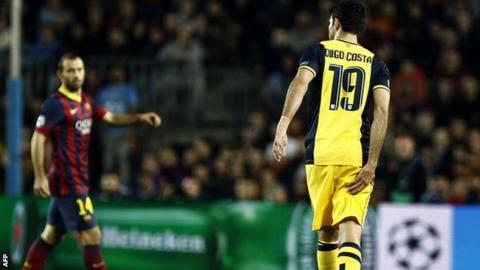 Atletico Madrid striker Diego Costa's thigh injury is not as bad as first feared, but he may still miss next week's Champions League quarter-final second leg against Barcelona. The Brazil-born forward, 25, strained rather than tore a muscle, according to his club after Tuesday's 1-1 draw. He came off after 30 minutes at the Nou Camp, clutching the back of his leg. Costa has scored seven goals in five appearances in this season's Champions League, and 25 in 30 La Liga games. Atletico coach Diego Simeone told a news conference that Raul Garcia, David Villa or Adrian were ready to stand in for the Spain international. The title-chasing side confirmed via their official Twitter account that Costa had suffered a "grade one strain in his right hamstring".